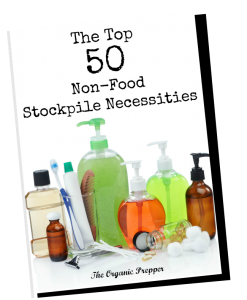 Here we are in the home stretch of the Stockpile Challenge! Lots of us have been living off our supplies for nearly a month. And with just a few more days to go, we’ve really put our stockpiles to the test. What’s on your list to add to the stockpile? I really look forward to hearing how you’re doing if you aren’t in the Facebook group, so please share in the comments below. Here’s what people had to say about the Stockpile Challenge. Here are the observations of the group. When I started, I was a little concerned – we haven’t lived in this house for long so I wondered if we would have what we needed. It’s gone surprisingly well. We still have quite a bit of stuff in the freezer and full pantry shelves. I haven’t had to break into the longterm supplies aside from milk. This has impressed upon me the importance of growing food year round, even if it’s just greens and sprouts on the windowsill. I’ll be adding more fruits and veggies to the cold room. That has been a true lifesaver! One more week to go, the food storage is still going. I did some shopping for our school and work needs. Also did buy some natural supplements and medications after depleting our original supply at the beginning of the month. I’ve got our meals planned for February, so we can make a bigger dent in the freezer inventory. My pantry looks a little less crowded but still standing. This has been a great challenge. Looking forward to the next practice. Bad news is: I’m going shopping on Sunday. Good news is: I’m shopping on Sunday. But I’m planning to shop for the next 4 weeks armed with what I’ve learned. I’ve been able to hone my baking skills. These things I’ve been meaning to learn how to make or perfect I’ve been able to do. I’ve started thinking about how many ways I can use things. I made bread last night but it fell so we had french toast this morning. We’ve been getting a few eggs everyday so I’ve had to be creative there. Overall, it’s been a great learning experience. I’ve been slowly clearing out the deep freeze and the cellar is still full but the fridge is pretty bare as is my kitchen pantry. I have learned to stock up when items we use, are on sale, even if it is just to put into the stockpile. I learned that adult children will cheat with takeout, to have what they want. And I learned that making my own herbal cough syrup works better than store bought. I’m so happy that I dried all my herbs from the garden this year. All good here. After the fresh milk expired I switched to Nestle La Crema and am still a happy camper. The one thing I actually ran out of was cranberries but I have lots of other dried fruits so that’s fine. Nuts and blueberries are great for the same things I used cranberries for, oatmeal, muffins, etc. and I have oodles of those. I didn’t have to crack open any long-term supplies or medium term supplies. I still have half a bag of potatoes in the pantry, onions, a bag of carrots and a head of lettuce in the crisper, so I still have some produce that is fresh. I haven’t felt deprived but I have felt empowered! I somehow ran out of my comfy tampons this week (I usually stock two months worth) and then forgot to buy more when I was in town! Add that to the fail list! The inventory is still to the brim, maybe too much so….. cheap shelving was stretched to the limit. One particleboard shelf was pulling away from the wall, had to break down and order some new shelving that can be flown over. However, while transferring the stock I noticed some holes in a few things and found out we have a little friend! So in a way it worked out before too much damage was done. Still have 2 romaine hearts from December 10 and a few other vegetables. Freezers are still full, but my goods have to last until April, but usually have enough through summer. It has gone fairly well. We had already signed up for SHARE this month (1 bag of meats and 1 bag of fresh) and Thrive but we are setting it aside and not using it when it comes. I’m rationing sweet potatoes. We have really been watching portion control. We are seeing a huge dent in our canning supply. I can over 1000 jars a year and that sounds like a lot but when you start eating it instead of buying some of the things we buy, it dwindles fast. This past week we emptied 29 pints. At that rate, it would not last the year that we planned until the following canning season. We did start eating more rice. I developed a few food allergies to things I love and am having to change some of what I eat. The bad thing is, Today I left my lunch in my office and had to be on the road. I’m stubborn. My lack of planning meant I skipped lunch and was grumpy. Not good.One thing that keeps nagging at me is that our food stores need to be organized differently. I’m preparing to retire and have decided that I’m going to try and do this again in a couple months. I definitely need to beef up my supplies. Add more water. Organize some more. Rotation, rotation, rotation! I did shop for fresh greens. I was feeling a little run down, couldn’t risk getting the flu (flu amongst family & friends). I did work through some of the already opened cans of freeze-dried foods and items I had in my freezer. Tonight’s dinner was the last of my open can of hamburger and the last of my fresh cabbage, freeze dried celery, carrots, onions, Somewhat of a stir-fry. Very tasty with fish sauce that was in my fridge but overlooked early in the challenge. I will need to store more freeze-dried & canned proteins. I now believe I can safely store root veggies, some fruits & cabbages in my shed which I never considered before. I did a new inventory of what I currently have, and when you start eating from your staples, wow. I did have some pretty creative meals when I date checked my canned foods and found some with very short dates. I also vowed to not open any of new cans or packages of freeze-dried foods. I did lose 5 lbs. during this challenge. I think this was from not having chips. I will buy some powdered green drinks for the future for extra nutrients. I will start growing microgreens indoors again and whatever I can grow in containers out on my patio. Top priority other figuring out ways to store more water, learn how to can my own foods !!! Thanks, everyone ! This challenge has been a real wake up call. I am still going strong with the amount of food however, it’s a big mess sooooo inventory inventory inventory! I did go shopping with my mom on Thursday. We go every 2 weeks now instead of once a week like she was used to. I skipped buying anything 2 weeks ago. I did buy a few things for the hubs, he is getting back after 3 weeks of work on the North Slope of Alaska. Our dinners will still be from our stores as well as our breakfasts. We are not 3 meals a day people. Usually late breakfast and early dinner and a snack at night. The thing I noticed at the store is I was mentally drawn to simple, basic ingredients. I wasn’t tempted to buy the processed foods at all. If an ingredient can’t be used multiple ways, it simply doesn’t seem worth it after this challenge. I just finished up my four weeks. It really was interesting. We broke into one #10 of sausage crumbles, one #10 can on powdered eggs, and a package of milk. Once we move, I’ll start stocking up on wine and a few non-sweetened fizzy drinks as well. Please let me know how the challenge is going for you in the comments below. AND…I warmly invite you to join us for next month’s challenge. You can learn more about it HERE. 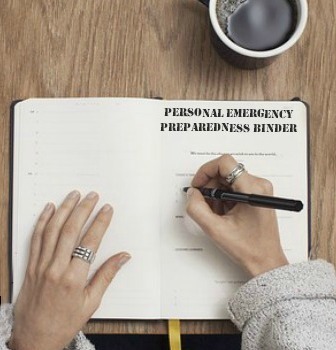 This one will help you save money, get better organized, and become more prepped.